WhoPaidThem aims to challenge our individual and collective preconceptions about political funding. While the current zeitgeist suggests an increasing ideological divide between Democrats and Republicans, we ask the question: how distinct are these parties when viewed from the perspective of how they're funded? Are we able to distinguish our politicians and parties based on actual funding data? Do we collectively understand who is influencing our politicians via campaign contributions? WhoPaidThem explores these questions by presenting a series of graphs and lists that invite players to make educated guesses about how funding is distributed and compare their guesses with reality. Players are then presented with their score and a comparison to other players' scores. The cumulative answers for all players are stored in a database to be analyzed collectively to determine if there are any discernible biases in what players believe to be true. The first question type lists the top five industries donating to Barack Obama's or John McCain's 2008 presidential campaign. 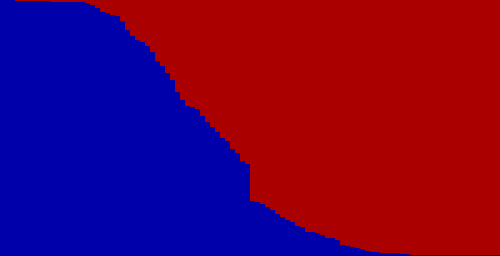 First, the player is presented with a bar graph representing the donations to one of the politician's campaigns by the top five largest contributing industries. The names of the industries are placed away from the bars. The player is asked to drag each industry name to its matching bar. The goal of this question is to see if players can correctly identify the main contributors to the politicians involved in the most expensive election ever. 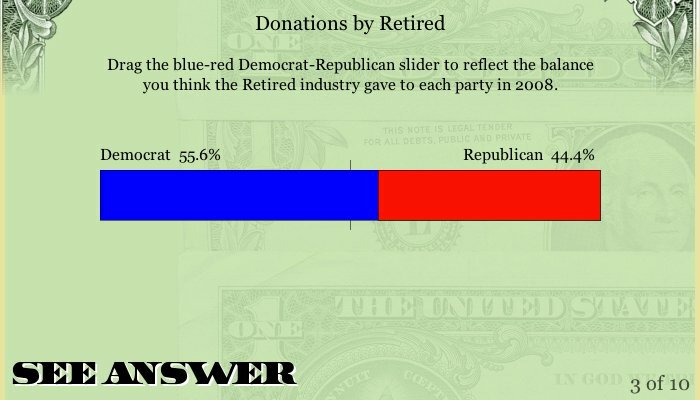 The second question type has players adjust a slider in a stacked bar graph representing the percentage that a certain industry donated to either Democrats or Republicans. Because various industries often have perceptual associations with one political ideology or another, this question was designed to test these perceptions against reality. The third question type asks players to identify the dollar amount that an industry spent on lobbying given a list of values spanning a range from six digits (e.g. $123,456) to eleven digits (e.g. $12,345,678,901). The goal of this question is to see if players individually and collectively understand how much money industries spend to influence politicians. Because it can be difficult to contextualize numbers as large as these, we expect that there will be difficulty situating (at least initially) the correct order of magnitude with each industry. It must be noted that there are various technical and design factors that may skew the results and analysis of this project. For example, players can play as many games as they like, getting better scores with each new game. Therefore, giving players the option to re-play the game may artificially increase the median score value. On the other hand, users may answer incompletely if they become bored with the question, artificially decreasing the median score value. Keeping the aforementioned sources of error in mind, the following analysis will focus on discovering trends in the cumulative data. The following results include the 268 full games played between May 17th, 2010 and June 9th, 2010. Partially completed games are not included in these results. Why did players score so low on the rank questions? The scoring system is part of the reason. Half of the question's possible points are awarded for identifying the single highest contributing industry to the politician's campaign. Players only correctly identified "Lawyers/Law Firms" as Obama's top contributor 32% of the time. Even more extreme, McCain's top industry ("Retired") was only identified 17% of the time. One explanation for the discrepancy between player's ability to identify Obama's versus McCain's top contributors is the high public awareness of Obama's previous experience as a law professor. 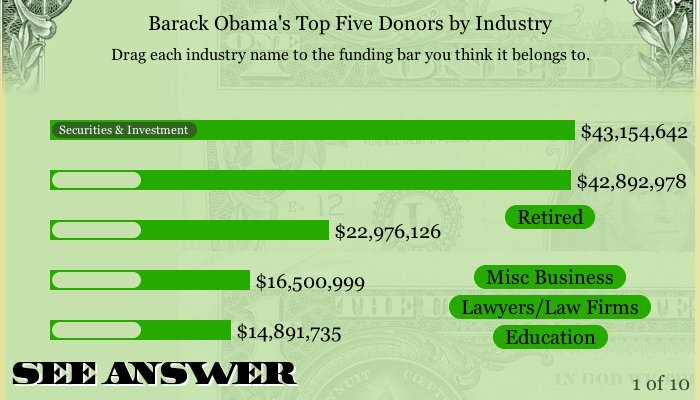 Cognizant of Obama's ties to the "Lawyers/Law Firm" industry, players correctly identified that group as a top contributor. These scores are very close to what one would expect if players were answering randomly. After running a simulation of answering a question of this type randomly 100,000 times, the median score was 1 and the average score was 2.0. In actuality, on the Obama rank	question, the median score was 1 and the average score was 2.32. For the McCain rank question, the median score was also 1 and the average score was 1.59. The similarity between the random simulation numbers and the actual numbers suggest that players may selecting their answers randomly. 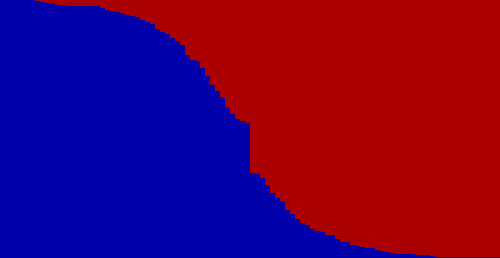 Each row of pixels in the stacked bar graph figures below represents a single player's answer to a compare question. All player's answers are ordered and stacked upon each other to indicate how players cumulatively responded to the question. For example, in all four of the figures, a "cliff" at the 50% Democrat-50% Republican mark is very apparent. This cliff suggests that players (for one reason or another) leave the slider at the default location. 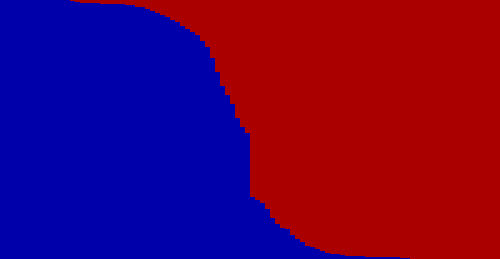 To see what the figure looks like without this cliff, move your mouse over the image. Players correctly identified Republicans as receiving the majority of contributions from the "Retired" industry. The actual data shows that retired people gave 52% of their donations to Republicans. The median answer by players was 58% of donations were given to Republicans. In this case, players overestimated the lopsidedness that this industry donated to parties in 2008. Players also correctly identified Democrats as receiving the majority of contributions from "Lawyers/Law Firms", however most users were well off on the magnitude. The median answer was that "Lawyers/Law Firms" gave 54% of their donations to Democrats, when in actuality, that number is 77%. Therefore, players vastly underestimated the lopsidedness of this industry's donations. 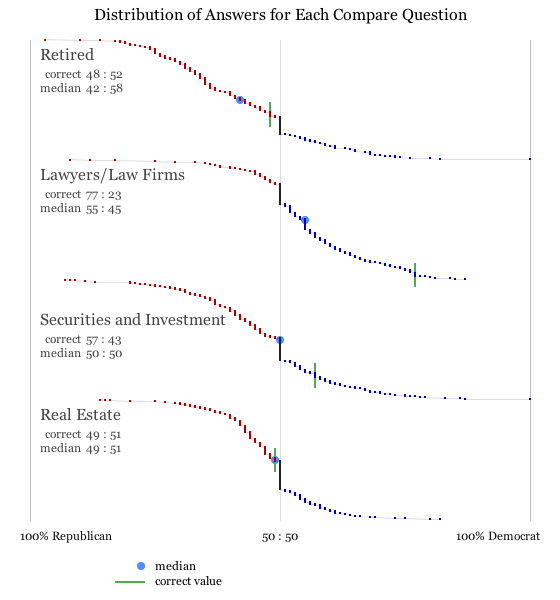 The median guess for the "Securities and Investment" is currently at a 50-50 split. In this case, the correct answer is that the "Securities and Investment" industry gave 57% of its donations to the Democrats. The fact that players' guesses hovers at 50-50 could indicate that people don't generally associate with one party with this industry. Players correctly answered that the "Real Estate" industry gave slightly more to Republicans than to Democrats. Additionally, the median answers were nearly exactly accurate: members of the "Real Estate" industry gave 51% of their contributions to Republicans, which is what the players guessed. Very likely, the ease of this question is due to the fact that--of the given options--only two are correct answers (eight and nine digits). Therefore, as a player notices that the answers from previous digits questions are either eight or nine digits, their answers likely become anchored on those values, causing them to answer subsequent questions correctly. The three different questions varied drastically in their difficulty level. The rank question is the most difficult, followed by the compare question, and finally the digits question. Looking at the parallel coordinate plots below, it is clear that the compare question was well understood by most players, the rank question was not well understood, and scores on the digits question therefore dictated the overall score. In other words, most players earned nearly 100% of the possible points on the compare question, close to 0% of the points possible on the rank question, and had a much more even distribution of the digits question. The fact that the compare question and the rank question compress player scores into the top and the bottom suggests the possibility that these two questions do not accurately capture player knowledge. While the collected results certainly point to the difficulty players have in correctly associating graphs with their underlying funding data, one of the more telling take aways from this project has come from few instances in which we were able to observe the reaction of players sitting down in front of the computer screen to play. Upon seeing the very first question, some players lamented their own inability to answer questions of this variety. Unfortunately, these players weren't first asked to evaluate their own perceived knowledge of political funding beforehand. Future renditions of this experiment would certainly benefit from such information. If this information were available, it would be interesting to determine the correlation (if any) between a player's perceived understanding of political funding and their final score. WhoPaidThem peeks at our understanding of political campaign funding through a series of interactive graphics. As an alternative to showing visualizations of funding data, WhoPaidThem presents a series of graphs and lists that invite people to make educated guesses about how funding is distributed, then compare their guesses with reality. The guess/answer comparisons ask questions about our perceptions of funding. For example, given a graph showing the amounts that the most "generous" industries contributed to a candidate, can people correctly rank the top contributors? Or, given a specific industry, can people guess the balance of that industry's funding to Democrats and Republicans? Finally, for a single industry, how well do people understand the magnitude of dollar amounts that industry lobbyists spent last year to promote their causes? By raising questions like these, WhoPaidThem aims to challenge our individual and collective preconceptions about political funding. Industry Ranking by Donation Values - 5 points are awarded for correctly identifying the highest donating industry. 2 points are awarded for identifying the second highest donating industry. 1 point is awarded for identifying each of the remaining three industries. 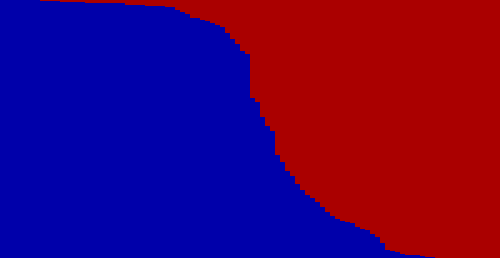 Democrat/Republican Donation Slider - The number of points received is calculated by the following formula where x_guess it player's guess and x_actual is the actual value: (100 -|x_guess - x_actual|)/10. 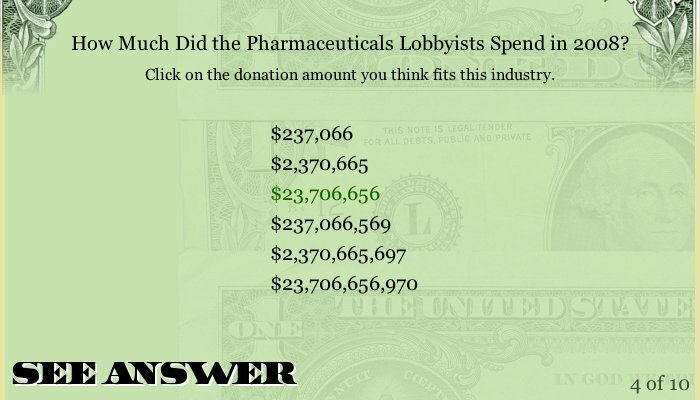 Order of Magnitude of Lobbying Spending - A correct answer is worth 10 points. An answer off by one order of magnitude is worth 5 points. No points are awarded if the player's answer is off by more than one order of magnitude. The following definitions are based on information from OpenSecrets.org and Wikipedia. Industry - Donations by an industry include money by Political Action Committies (PACs) and individuals with associations to that specific industry. Click here to read the methodology of how these numbers were compiled. Leadership PAC - While all politicians raise funds for themselves, many also raise a separate pot of money, commonly called a leadership political action committee, to help other politicians. By making donations to members of their party, ambitious lawmakers can use their leadership PACs to gain clout among their colleagues and boost their bids for leadership posts or committee chairmanships. Politicians also use leadership PACs to lay the groundwork for their own campaigns for higher office. Lobbyist - A lobbyist is a person who tries to influence legislation on behalf of a special interest or a member of a lobby. The following definitions have been copied from OpenSecrets.org. Automotive - The auto manufacturers themselves are not even close to being the biggest spenders when it comes to the automotive industry. That honor goes to auto dealers. In 2008, the National Auto Dealers Association, a Center for Responsive Politics "Heavy Hitter," contributed $3 million to federal level candidates and committees -- more than the "Big Three" automakers combined. Defense Aerospace - The hundreds of billions of dollars the federal government spends each year on defense are part of the reason defense aerospace firms make millions of dollars in campaign contributions. Education - Since school districts, colleges and universities are general prohibited from forming political action committees, political contributions from the education industry generally come from the individuals associated with the field. Electric Utilities - Electric utilities monitor congressional action on a variety of issues, including clean air regulation and waste storage, but since the early 1990s the industry has focused most of its attention on what has become a perennial issue for Congress -- electricity deregulation. Health Professionals - All health professionals are included in this category: various physicians, psychiatrists, dentists, chiropractors, pharmacists, nurses, nutritionists and anyone else providing health care services--as well as their professional associations. Laywers/Law Firms - The lawyers/law firms industry encompasses a variety of law-related interests. It consists of both trade organizations that promote legislation beneficial to the industry and members of prestigious firms -- former lawmakers and high-ranking government staffers -- that are highly involved in various political processes. Oil & Gas - This industry, which includes multinational and independent oil and gas producers and refiners, natural gas pipeline companies, gasoline service stations and fuel oil dealers, has long enjoyed a history of strong influence in Washington. Pharmaceuticals - The pharmaceutical and health products industry includes not only drug manufacturers but also dealers of medical products and nutritional and dietary supplements. Real Estate - The real estate industry has been blamed, in part, for the 2008 financial crisis. Shoddy lending practices, government support for home ownership and Wall Street's attachment to high-risk mortgage products fueled a major investment craze that collapsed in September of 2008. Republican/Conservative - Contributions from Republican/conservative interests come from Republican-based groups (excluding official party and candidate committees) and generic conservative groups. This category also reflects individual contributions from Republican Party officials and those who donate both to a Republican/conservative political action committee and a candidate whom that PAC supports. Retired - Contributions in this category come from donors who list their occupation as "retired." All the money comes from individuals, which when combined, can make a big impact. Securities & Investment - Stockbrokers, brokerage houses and bond dealers give the bulk of campaign dollars in this politically influential industry, which also includes commodities dealers and exchanges, investment banking houses, stock exchanges and venture capital firms.